The population of Eritrea is equally divided between Christian (Orthodox Church, Roman Catholic and Lutheran protestants) and Muslim religions. The population of the high plateau (Asmara) is predominantly Christian, whereas that of the lowlands and the coast are predominantly Muslim. Despite contrasts between the Muslim and Christian religions and the potential for conflict, both religious groups have managed to live together in harmony and in peace. Followers of the prophet Mohammed traveled to the Eritrean coast in 615 to establish relations with Adulite authorities and seek protection for the new faith, making this one of the earliest non-Arabian sites for contact with Islam. Among the many important historical sites in Eritrea is the 500-year-old Sheikh Hanafi Mosque in Massawa. Muslim holidays follow a lunar cycle. The exact dates of each Muslim religious holiday will change every year. The highest Muslim religious authority is the Dar Al-Ifta, headquartered in Asmara. 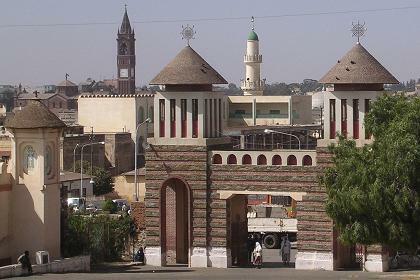 Al Khulafa Al Rashiudin Mosque - Asmara Eritrea. Eritrea's links to Christianity are thought to stretch back to the arrival of ship-wrecked Syrian traders in the beginning of the 4th century. Over the years since, the Orthodox Church has served as a critical repository of written' records and iconic art. 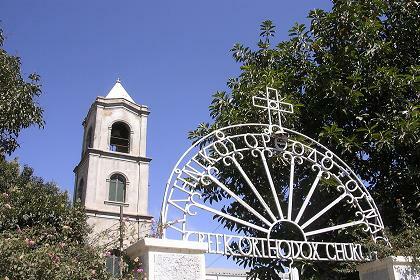 The Eritrean Orthodox Church separated from the Ethiopian Orthodox Church after Eritrea's liberation and now functions as a self-governing church in communion with the Coptic Church of Egypt. Orthodox events are based on the Julian Calender which puts these events approximately one week later than those celebrated under the Roman calender. Today, there are at least eighteen Orthodox monasteries in Eritrea. Many were built high atop mountain ridges or tucked into inaccessible places to protect against raids and attacks in the past. Among the oldest and most important are those at Debre Bizen (near Nefasit), Hamm (near Senafe) and Debre Sina (near Keren). The Debre Bizen monastery houses more than 1,000 medieval manu-scripts, including fine illuminated parchments bound in thick leather, cloth and wood. 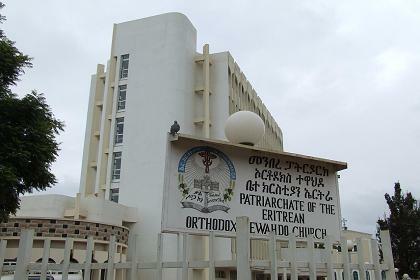 The highest Orthodox religious authority is the Patriarchate of the Orthodox church of Eritrea / Orthodox Tewahedo Church headquarters in Asmara. Permission to visit any monastery is to be obtained from this office! 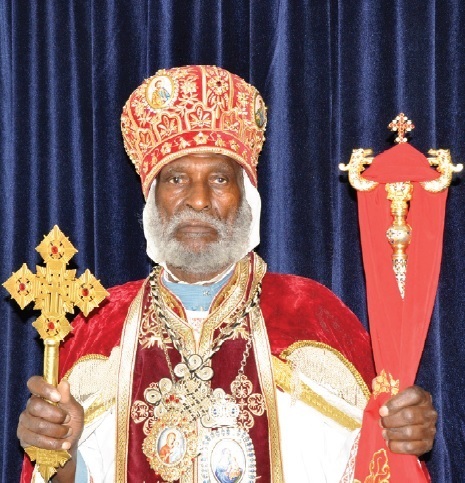 His Holiness Abune Dioskoros, 4th Patriarch of the Eritrean Orthodox Tewahdo Church. There are also significant Catholic and Protestant Christian minorities living mainly in or near urban centers in the highlands and the western slope areas. Catholicism was first brought to Eritrea by the Jesuit Fathers in 1600. In 1632, this order was expelled for wanting to convert the country to Catholicism. In the nineteenth century the Italians began to bring Eritrea under their protection and introduced Roman Catholicism. 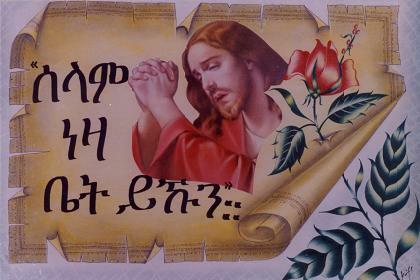 "Bless the people living in this house"
The protestant presence in Eritrea is small. Missionaries appeared in the 19th century and established the Lutheran and Evangelical church. These organizations have been allowed to continue to practice. Persistent US anti Eritrea conspiracy and agenda's have resulted in distrust of US rooted religious groups. New groups have therefore been discouraged from establishing a base in Eritrea. The Eritrean authorities monitor these groups to prevent they will be misused as Trojan Horses for US activities destabilizing the Eritrean society. Most Kunama practice their own traditional religion, centered around worship of the creator, Anna, and veneration of ancestral heroes. There are holy places associated with Anna but no institutional religious body, as the belief system is transmitted through elders of the community. Asmara Synagogue was build in 1906 to cater to the needs of the small Jewish community that settled in Eritrea. In 1941 when the British administered Eritrea there were 350 Jews in Eritrea, but by the end of 1948, the year which marked the creation of Israel, there were just 50 left.